It is recommended that the children listen to the Ruquiya daily for the maximum benefit. The following Du'a should be recited by parents or an adult when the child goes outside the house. The Ruquiya should be listened daily by an ill person until Allah SWT cure his or her illness. Also the Ruquiya can be listen by anyone who has the symptom of distress, calamity or any minor symptom of evil possession. 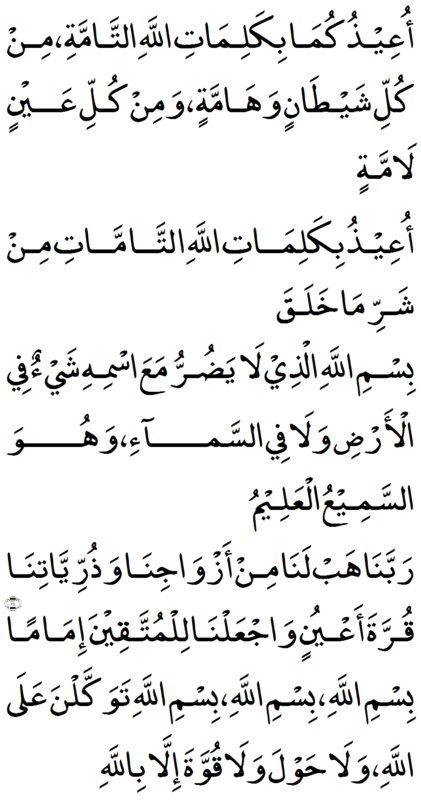 Full Arabic text for part 2 to follow In-sha-Allah……. The Ruquiya should be listened daily by anyone who has been possessed by Sihr, Jinn or any other distress from the unseen until the person is fully recovered. It is also recommended to play the Ruquiya and sura Al-Bakarah occasionally in the house for the protection from the unseen.